Abstract: Instead of waiting for the videocard bandwidth crunch to roll around, nVIDIA introduced the nForce4 SLI x16 chipset. And from this came MSI's latest overclocking motherboard deluxe! When it comes to computers, bandwidth rules. The more bandwidth between videocards and CPU, or CPU and memory, the better a computer will perform. Now aside from the RDRAM debacle (assuming you're old enough to remember those dark days), this rule has generally held true, and subsequently large leaps in performance are usually due to large increases in system (or component) bandwidth. The first generation of motherboard chipsets that supported two PCI Express videocards split the PCI Express x16 bus evenly down the middle. In essence each SLI videocard received eight PCI Express lanes apiece. Cutting the available bandwidth in half is not necessarily as bad as it may sound now, since early PCI Express videocards really never used a full 16 PCI Express lanes by themselves, let alone in pairs. Now that a few generations of videocards have passed, we're starting to see consumers ask if eight lanes of PCI Express per card is really enough? Instead of waiting for the videocard bandwidth crunch to roll around, nVIDIA introduced the nForce4 SLI x16 chipset. Overall it's a very minor refresh to a the highly successful nForce4 SLI core logic, and through one small change it addresses the potential bandwidth bottleneck expected to exist within next two-to-three videocard generations. Since PCI Express is going to be around for some time, we like this proactive approach. The 'x16' SLI chipset was a quiet announced, and motherboards using the nVIDIA nForce4 SLI x16 and nVidia C51D have been slow to reach retail. The MSI K8N Diamond Plus is one of the few nForce4 SLI x16 motherboards that is readily available, and it's a very sweet little slab of PCB. The hardware goodies include dual 10/100/1000 Gigabit NICs (one via the PCI bus, and the second via a PCI Express bus), 400mpbs IEEE 1394 Firewire (one at rear, two internal), USB2.0 (four at rear, six internal) an additional Silicon Image Serial ATA II controller for a total of six SATA2 channels, and the obligatory 7.1-channel Creative Sound Blaster Audigy soundcard! Yes, that's a Creative Sound Blaster Audigy APU! 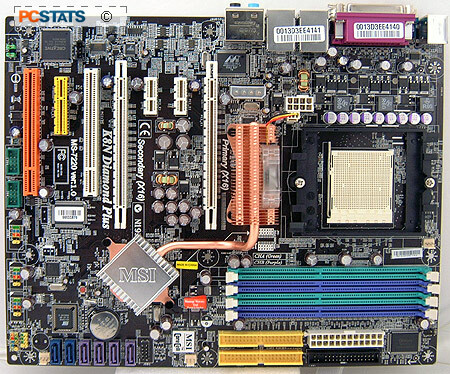 The MSI K8N Diamond Plus motherboard boasts support for Socket 939 AMD Athlon64/X2/FX and AMD Opteron processors. Consequently it supports up to 4GB of non-ECC unbuffered PC3200 DDR dual-channel memory, in four DIMM slots. Aside from its two PCI Express x16 slots (each which is blessed with a full 16 PCI Express lanes) there are two PCI Express x1 and a single physical PCI Express x4 slot (with just 2 PCI Express lanes bandwidth) for high bandwidth device expansion. 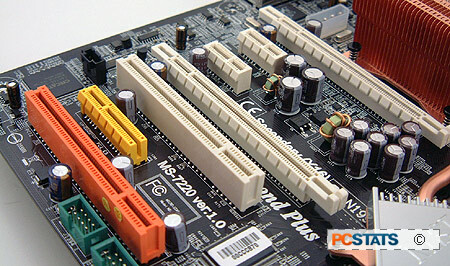 Two legacy 32-bit PCI slots handles all the other peripheral expansion tasks. At first glance the MSI K8N Diamond Plus looks like a pretty regular nVidia nForce4 SLI x16 motherboard... it support SLI, has a pile of onboard features, it even has that somewhat alluring 'new motherboard smell' that we reviewers grow quite fond of, though it's probably some horribly toxic cast off from the solder bath or PCB fabrication... Anyhow, if you take a moment and look closely at the shot of the board right above, you just might notice something that shouldn't be there. Look right next to the PCI Express x4 slot, the yellow one. That little yellow PCI Express x4 slot itself isn't closed on the end, and that allows it to accommodate a third PCI Express x16 videocard if you wish. Now the third videocard cannot be combined with an SLI setup for more 3D performance, but does allow the K8N Diamond Plus to support up to six computer monitors (two monitors per videocard) in one sitting. Pg 4. Cooling the nForce4 SLI x16 Chipset and Overclocking!